Cecelia Reed is the editor of the Smithsonian Associates‘ monthly program guide. A longer version of this article originally appeared in their August 2014 newsletter. The waters that surround the island nation of Japan have always been an integral part of its life and culture. Legend has it that the islands were born of male and female deities that descended from heaven. The mountains, rivers, and lakes became home to the plants and marine life that have sustained human life for millennia. Japanese respect and appreciation for this life in all its beauty and variety is at the heart of Bountiful Waters: Aquatic Life in Japanese Art, on view at the Freer Gallery of Art through September 14. The exhibition brings together for the first time a selection of woodblock prints, paintings, illustrated books, and ceramics from the museum’s collections, many of which were gifts of founder Charles Lang Freer. However, the origin of the show’s highlight—20 woodblock prints of fish and crustaceans by artist Utagawa Hiroshige (1797–1858), known as the “Large Fish” series—is another story entirely. Hiroshige’s fish didn’t leap suddenly onto the museum walls. Rather, it took nearly two decades to find and catch them all, says Ann Yonemura, the Freer|Sackler’s senior associate curator of Japanese art. “I have been working with John Fuegi and Jo Francis, the collectors of the [Large Fish] prints, for almost 20 years,” she explains. When this partnership began, Fuegi, today a documentary filmmaker, was a professor at the University of Maryland with an interest in Japanese art. “He came into the museum and asked to look at a rare Edo period printing block from Hiroshige’s fish series” that had come from Charles Lang Freer, Yonemura recalls. “When John saw the dreadful condition of the actual finished print, he asked if I’d be interested in his helping to build, incrementally over time, a set for the museum that was in better condition. I told him it was a great idea.” Fuegi started the project in 1995. Today, the Freer’s is one of the few public collections with a complete set of prints. 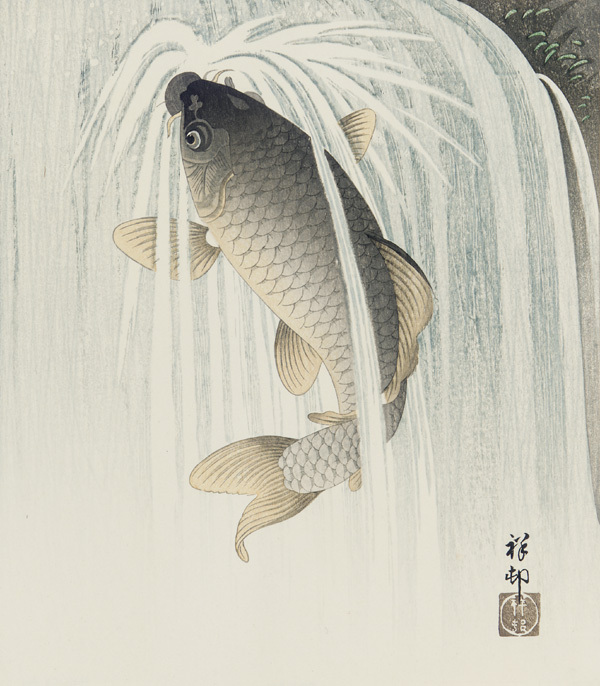 The result of this 20-year curator-collector partnership, says Yonemura, is a “spectacular collection of Japanese fish prints and paintings” from which she was able to design a rich and varied exhibition. Bountiful Waters features the first showing of a full set of prints in the “Large Fish” series, accompanied by lively and lyrical verses by various poets. Bountiful Waters remains on view through this Sunday. Learn more about Japanese art in the Freer|Sackler collections. Previous Post Previous Post: Why is the Smithsonian Covered in Yarn? !